Tripe, beef, onion, and cilantro come together in this quick stew, similar to Mexican menudo. And it can be done in less than 1 hour thanks to cooking in the pressure cooker. Typically, cooking tripe would take 5 to 6 hours, but it is achieved in just 45 minutes in the pressure cooker. Place tripe, beef, onion, and cilantro in pressure cooker and add enough water to cover. Lock pressure cooker lid in place and set steam vent to Sealing. Select Pressure Cook (Manual) and cook for 45 minutes on High Pressure. Set steam vent handle to Venting to quick-release pressure. Remove lid. Stir hominy, tomato sauce, cumin, oregano, chili powder, and garlic powder into tripe mixture until evenly combined and menudo is warm. 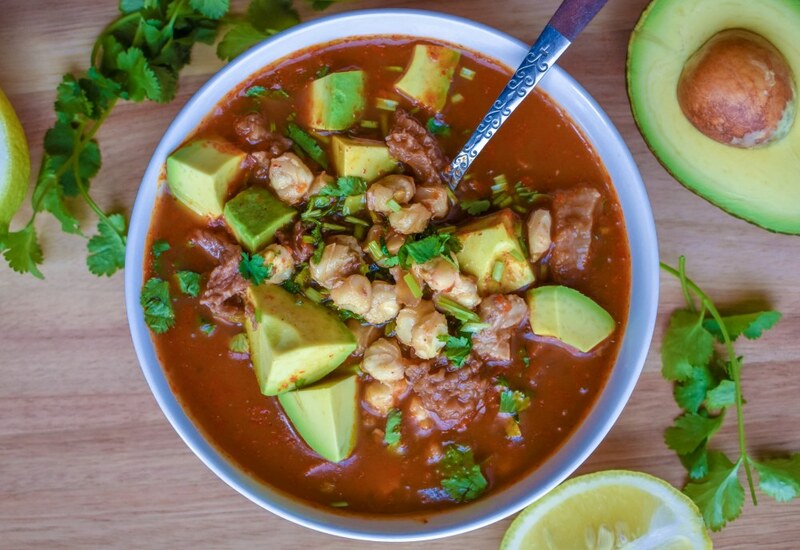 Serve menudo with lemon juice, cilantro, and avocado. Tripe is the meat of a cow's stomach lining. It is important to thoroughly clean the tripe before cooking it. Rinse tripe under cold water until clean and trim excess fat before cutting into small pieces. Substitute pork or other meat for beef chuck or leave it out and just use the tripe. Per Serving: 558 calories; 27g fat; 29.4g carbohydrates; 51g protein; 492mg cholesterol; 628mg sodium. I grew up eating my grandmothers menudo, so I have super high standards. With that said, I really, really liked the stew. I followed the instructions to a tee and it was perfect. How the pressure cooker can inject so much flavor in such a short amount of time, it's magic! Can't wait to make this again soon.